Hoka One One recently launched two fabulously light, super cushioned shoes: The Huaka and Clifton. 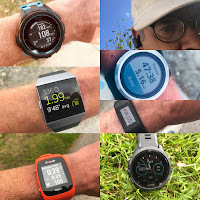 Having now run in both and reviewed the Huaka earlier here, where I called it the first "fast" Hoka, I can say now having run in both, that these close "cousins" are quite different in feel and even purpose. 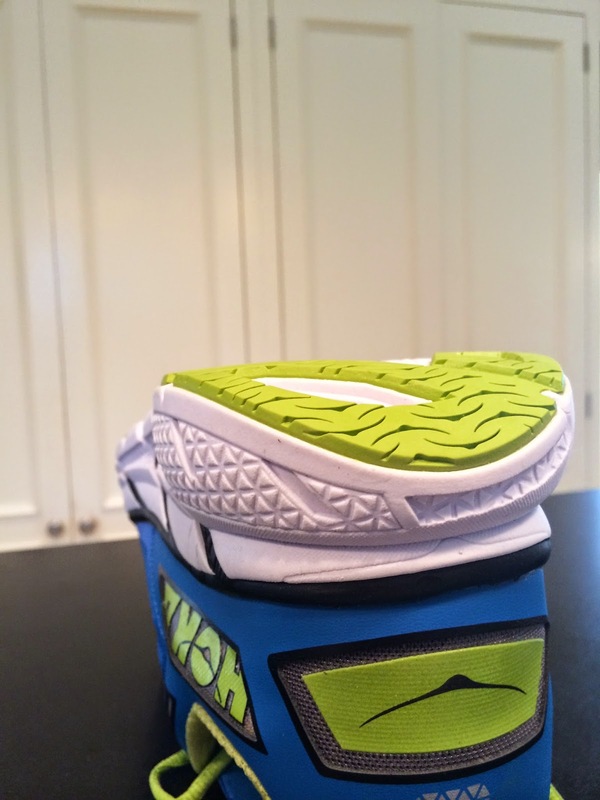 Hoka's marketing theme is "Crazy Fast. Crazy Light. Crazy Does." and for sure marketing spin meets reality with these shoes, although I will quibble that the Huaka is for me a faster shoe than the Clifton. Both fit me true to my size 8.5 with the Huaka initially feeling a touch too roomy until I removed the speed laces. The Huaka is a no compromises road and trail hybrid with an energetic and dynamic midsole (RMAT) with great rebound, decent support and traction for all but the roughest or muddiest trails. The Clifton has a softer compression molded midsole (CMEVA), which is noticeably softer than Huaka in the heel.While some will run some trails with it, its purpose is as a road running shoe. 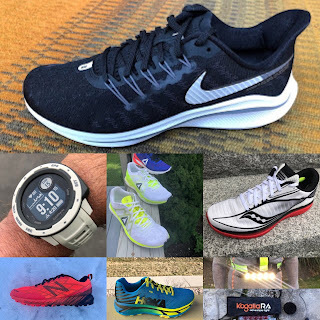 I have run 2 half marathons including a 1:36 AG win on a downhill course in the Huaka ( purchased retail) , many Utah smoother trail miles, along with both hilly and flat roads in this most versatile shoe. Surprised how stable the RMAT midsole is on trails for such a light shoe. The Cliftons (provided at no charge by Hoka for review purposes) are new to my rotation but are a welcome addition with more miles and updates to come. The two shoes share a similar upper material weave pattern but the Clifton's seems to be made of a softer thread and thus for me less plasticy and easier to adjust than the Huaka. While a lighter shoe overall, Clifton has more sewn on overlays and leaves out the 6th lace eyelet of the Huaka upfront. Some may find the 6th lace eyelet of the Huaka a bit constricting over the big toe, I did, but once running the snug fit is not an issue. The Huaka has no sewing that I can see, and thus I must assume as it is a bit heavier, that the additional weight comes from the denser RMAT midsole material. Overall I find the forefoot fit and comfort of the Clifton better than the Huaka and the rear foot fit of the Huaka more secure than the Clifton where there is actually some sagging of the upper on the medial and lateral sides just ahead of the heel when standing, not noticeable when running. The Clifton on toe off seems narrower and more agile on the road than the Huaka but on measuring the outsoles they appear to be the same width. This feeling may come from the great full contact of firmer outsole upfront on the Clifton (the green areas) as well as the slightly softer more flexible upper whereas there is less coverage upfront of firmer outsole (blue areas) on the Huaka. The heel feel of the Clifton is noticeably softer than the Huaka, too soft for my taste out of the box. There is 2mm more foam and softer foam than the Huaka in the heel. I seem to sink in more than I would like but don't get me wrong this is one incredibly light cushioned shoe. I think this comes from the softer EVA in the Clifton and also a far more pronounced heel bevel than Huaka (see below). All is not lost as adding a Superfeet Carbon insole to my Clifton's changed the ride a great deal. firming up the heel and springing me forward faster. I use the same insole in my Huakas when I run trails giving it even better stability and support. When run at speed the softness becomes less noticeable. I just ran a 3 second PR on my 0.9 mile Strava test segment and the Clifton felt fast if a bit muted in road feel. The Clifton comes with 2 insoles, a conventional molded EVA insole as found supplied with most shoes and a thinner flat Ortholite midsole which when used can add a bit more volume or combined with the molded insole for narrow or low volume feet for a more precise fit. 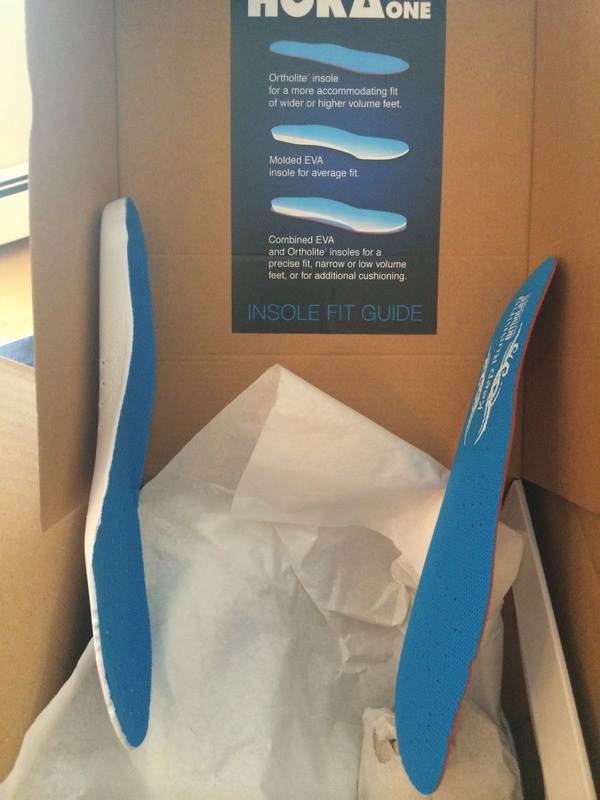 Hoka One One Clifton is supplied with 2 insoles. 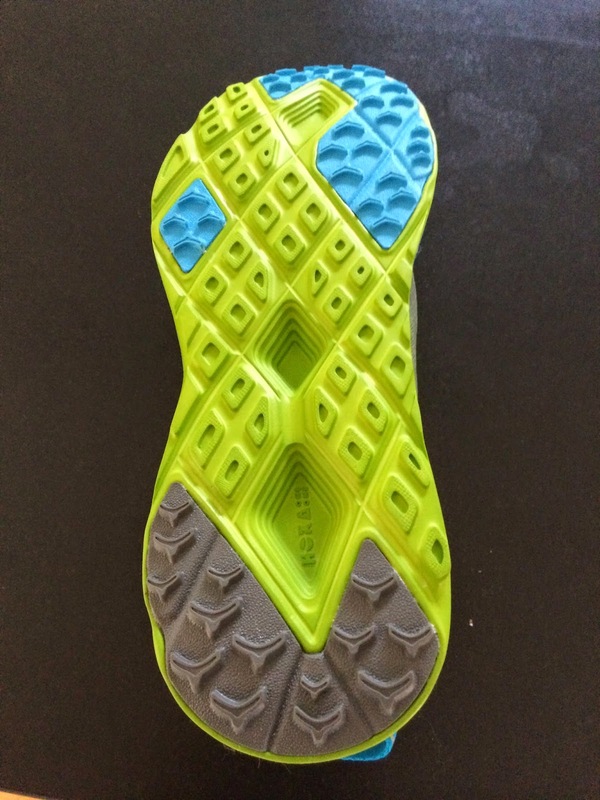 As with all Hokas today, the smooth ride comes with a softer outsole or in places no outsole. Hokas tend to wear fast initially for me in the toe and far back of heel then once "worn in" the wear tends to slow down. Others online report some delamination of the upper overlays. I have 150 miles on my Huaka and there is a bit of delamination but nothing that overly concerns me. I also cut off the speed laces from the Huaka and replaced with the supplied laces as the speed laces just didn't seem to give me a good fit and tended to loosen. Clifton and future Hokas will only come with laces. Runners will not go wrong with either of these fabulous shoes. Out of the box, without the after market insole, my nod goes to the Huaka for its versatility and dynamic feel on both roads and trails. I plan more fast runs in the Clifton with Superfeet Carbon insole but tend to think the softness of the midsole especially in the heel takes some pop out of my ride when compared to Huaka. Huaka does cost $20 more than Clifton, and its outsole may wear a bit faster on the road, but so far its my first pick of these 2 close cousins. Clifton review by my friend JA over at Reading, Running, and Red Sox here. You can support my blog by considering purchasing your Cliftons or Huakas or both! as well as SuperFeet Carbon insoles via the links below. Thank you! I totally agree with this assessment; so much that I sold my Cliftons and run with the two pairs of Huakas. Thanks Michael. And for something closer to Huaka than Clifton the new Clayton is worth considering. You can also follow Road Trail Run on Facebook: roadtrailrun.com or Twitter: roadtrailrun.